Arsenal: Ospina, Bellerin, Koscielny, Gabriel, Monreal, Coquelin, Elneny, Iwobi, Ozil, Alexis, Welbeck. Everton: Robles, Baines, Funes Mori, Jagielka, Coleman, McCarthy, Besic, Cleverley, Lennon, Barkley, Lukaku. All Arsenal eyes now turn to Selhurst Park for Crystal Palace v Leicester. You can follow that game here and keep across all of Saturday's games here. That is all from me. I'll see thee. "Subdued and disjointed from Everton. A really, really poor game from them today. "I expected Arsenal to tire near the end of the game which is what happened, but Welbeck, Iwobi and Ozil all looked good. Over 90 minutes Arsenal were the only team who looked likely to win this game." "It seems to be the same with Everton, one step forward, two steps back. Great result last weekend against Chelsea, getting themselves to a cup semi-final but today it's been the same old Everton. Wide open, poor defensively and it's been fairly comfortable for Arsenal. Arsenal have fully deserved to win this game." Mark Clattenburg puts Everton out of their misery. They were awful. Arsenal were brilliant in the first half and as good as they needed to be in the second. It keeps the Gunners in the hunt for the league title at the end of a week that nearly obliterated their season. We've had four of the added five minutes. Olivier Giroud goes close. Calum Chambers sets him up with a neat pass inside the box but he slices his effort past the near post and into the side-netting. 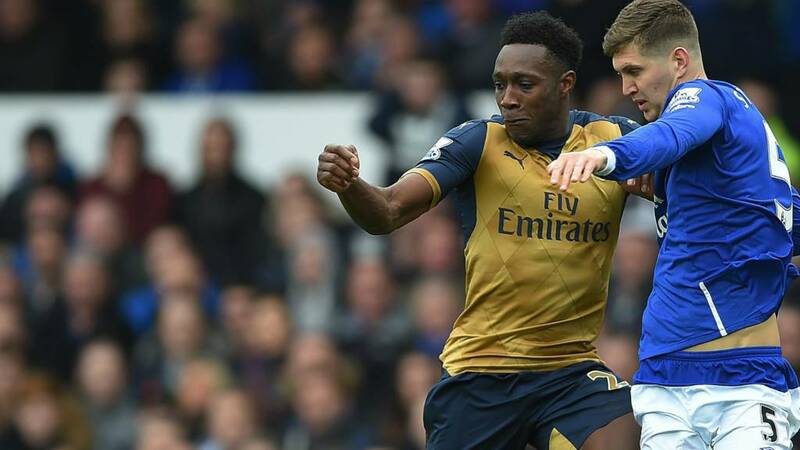 "I expected Everton to push Arsenal as they tired, up the tempo, spread the play. But it just hasn't happened at all. Romelu Lukaku has had absolutely no service. It has been infuriating." Everton corner. Straight into David Ospina's grasp. The ground begins to empty. The 90 minutes are up. Five minutes added. It would be some comeback for Everton now. Alex Barton: Everton fans making it a ‘toxic atmosphere’ because this is totally unacceptable. It’s happening repeatedly. An incredibly rare event - a sight of goal for Romelu Lukaku, who heads down Ramiro Funes Mori's cross inside the box but straight at David Ospina, who saves easily. Arsenal have not been as sharp this half, but they haven't had to be. They have managed this game with ease, having done all the damage in the first half. Barring a tiny period when David Ospina was struggling following a knock, Everton have offered nothing. A final Arsenal change sees Alex Iwobi depart to huge applause from the away fans. On comes Calum Chambers. "Giroud is absolutely furious, and I don't think he's the one who made the foul. But actually, I don't think there was a foul there - Jagielka just fell. The Gunners are unlucky." Gabriel has his critics but he has been really good today. He prevents Romelu Lukaku getting a kick again with a sliding tackle on the edge of his own box to intercept a pass towards the Belgian striker. The ball is in the Everton net from an Olivier Giroud header from a corner, but it won't count. The French striker is adjudged to have fouled Phil Jagielka before beating Joel Robles to the ball. Just over five minutes remain. Adam Duke: Hopefully when I'm on summer holiday with my Everton kit on people will mistake me for a Leicester supporter. Dire. Yousuf Ali: Everton are so poor that Wenger is opting to keep a half fit goalkeeper on the pitch against them. Arsenal are furious. And rightly so. Olivier Giroud wins a header and looks to then charge into the box to accompany Alexis Sanchez but is denied by an off-the-ball trip by Ramiro Funes Mori, who gets away with it. Bit of a cheap shot by the home defender. Seamus Coleman and Francis Coquelin square up to each other, requiring an intervention from Mark Clattenburg. Think that was just a bit of frustration on Coleman's part because Coquelin did nothing but challenge for a ball and win a goal-kick. Fresh legs for Arsenal as well. Mesut Ozil and Danny Welbeck depart (the former hobbling after getting clipped by John Stones), with Olivier Giroud and Kieran Gibbs coming on. 15 minutes to go.